I am just returning from a wonderful 12-day trip to Denmark for a wedding and then a week in Norway. It was a fabulous vacation shared with family and friends. Although we all did our best to disconnect from ‘real life’ - including our technological tethers - tech played an important role in for planning and during our travels. Consider it one tool among many. It is a great way to validate the recommendations from friends, guide books, etc. Trip Advisor is often a good way to find out something specific like the quality of a hotel’s free breakfast. Reliability depends on the number of reviews. It is much easier for a business to “game the system” if there are only a few reviewers. Discount the best and the worst reviews. The outliers are usually just that. Accurate information on travel times and route options. While driving the narrow and windy roads along Norway's fjords, knowing the distance to our destination was of little help in determining travel times. We found the GPS to be very accurate in predicting arrival time as it takes into account speed limits and any traffic. Warnings of road closures/detours. On one leg of a long car trip along fjords, we were warned of a road closure that saved us several hours. 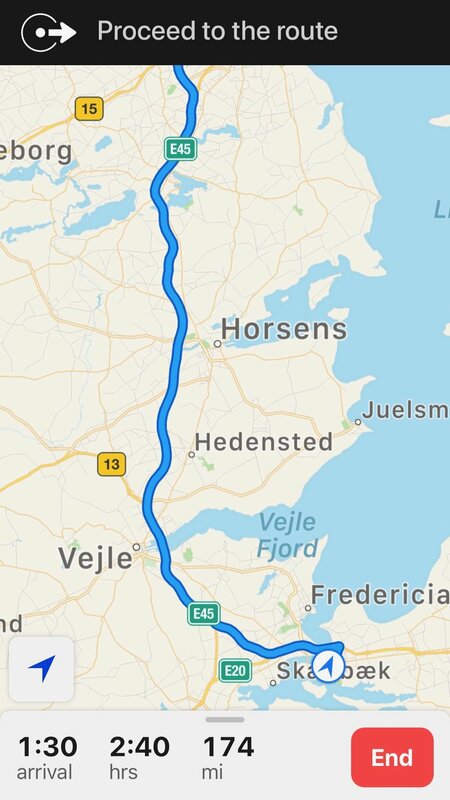 The GPS also let us know when our route involved a ferry crossing, which was sometimes suprisingly tricky on the paper map. Prepare for the possibility that you may lose connection in remote locations. Some apps allow you to download map data. Another option is to take a screen shot of your GPS. Our rental car supported Apple Car Play. By connecting my iPhone via a USB charger cord, we were able to display (and use) my phone's GPS to the car's large screen. Much easier than looking at the iPhone! English was spoken by nearly everyone we met in Norway and Denmark. Interestingly, menus proved to be the most challenging from a language standpoint. For translating the occasional phrase, google worked quite well. We would type “translate Norwegian to English” in Google to bring up the function. My daughter preferred a smartphone app that used the phone’s camera to provide an instant translation. Not perfect, but reliable enough to order lunch! She used Microsoft's Translator App but there are many to choose from. As a lifelong photography buff, its been bit difficult to give up traveling with a 'real' camera. But the quality of my iPhone 8 plus (and most smartphones for that matter) made it difficult to justify the extra weight and hassle of lugging a SLR. I probably took close to 1,000 photographs and was very happy with the quality and had no issues with storage space. I used many features of my iPhone's camera including the video, selfie-mode, portrait and panorama. There are a number of ways to share photos, but we chose to set up a Google Photo Album. After setting up the album on my Google Photo account, I set the privacy options to allow me to share a link with our fellow travellers so that they could upload photos as well. (Remember when wedding guests were given disposable cameras? This is the cloud version…) This way we can all see and download one another’s pictures. For our trip we decided to set up two albums - one for the wedding and another for our travels after. Most days we headed out early with little opportunity to change clothes. We had unusually warm weather in Norway, so checking the predicted temperates really helped before going on a hike. We were fortunate to have met people along the way with whom we would like to stay in touch. For me, Facebook and Instagram make it easy to maintain friendships with people I see infrequently. It is a great way to keep up on each other's lives when years may pass between visits.